Officially supported by Mojang! Over 5 million downloads and counting! • Look up hundreds of item recipes with detailed information and videos, now includes potions! • Browse Minecraft skins*, upload to Minecraft or download and modify! We have over 300,000 skins to choose from! Requires a minimum of iOS 4.3+. We can no longer support older versions of iOS as Apple do not support anything less than iOS 4.3 since iOS 6. If you are having issues installing this app because you are not using 4.3+, please upgrade your iPod Touch or iPhone using iTunes on your PC/Mac. Your mobile device must have at least 29.15 MB of space to download and install Minecraft Explorer Pro app. 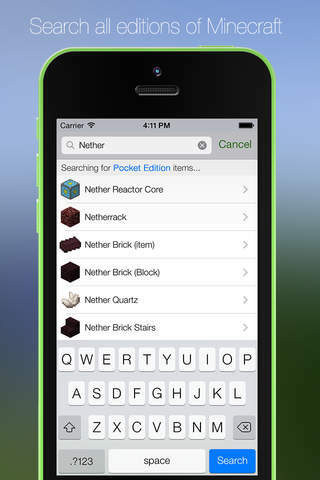 Minecraft Explorer Pro on sale for only $0.99! Download it from iTunes now to save money. Hurry in for the deals, they are updated daily. If you have any problems with installation or in-app purchase, found bugs, questions, comments about this application, you can visit the official website of 57Digital Ltd at http://www.minecraftexplorer.com. Contains a critical bug big for the Apple Watch app. Thanks for using Minecraft Explorer Pro! Our Watch app is still experiencing some difficulties, we are currently speaking with Apple to find out why. Thanks for your patience! - Apple Watch support! 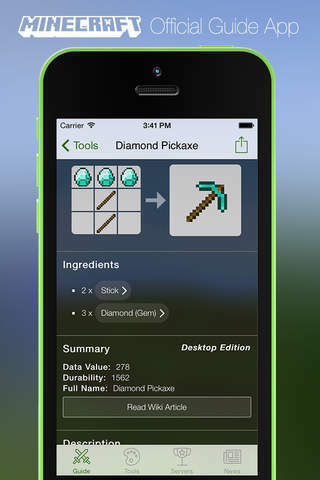 Now you can browse crafting recipes right from the comfort of your wrist; especially useful if you play Pocket Edition. You can even search for items right from your Apple Watch. - Updated content for the latest version of Minecraft! As usual, if you have any feedback reach out at http://support.57digital.co.uk! Thanks for using Explorer! Minecraft 1.8 content now included! Thanks for your continued support, enjoy!